IF non-democrats had lied and stonewalled inspectors general to the point that 47 had written a joint letter of complaint AND THEN IF the non-democrats lied and stonewalled until the DOJ IG complained almost a year later AND THEN IF the non-democrats stonewalled for a few more months AND THEN IF the non-democrats stonewalled so that watchdog groups complained, WOULD the “journalistic” wing of the democrats notice? Federal watchdogs are urging Congress to make sure all inspectors general, not just those at Department of Justice, have unfettered access to all official documents their respective agencies produce. The Council of Inspectors General for Integrity and Efficiency fired off a letter to top members of Congress Thursday encouraging Congress to reiterate through new legislation that the 1978 Inspector General Act already entitles IGs to all agency records. The letter comes two days after the Justice Department’s Office of Legislative Affairs asked Congress to pass legislation specifying that only the DOJ IG is entitled to all department records. Previously, the DOJ Office of Legal Counsel denied the department’s IG access to wiretapped communications or grand jury testimony. But the proposed fix is too little, too late, for an IG community where other federal watchdogs are facing similar access problems. 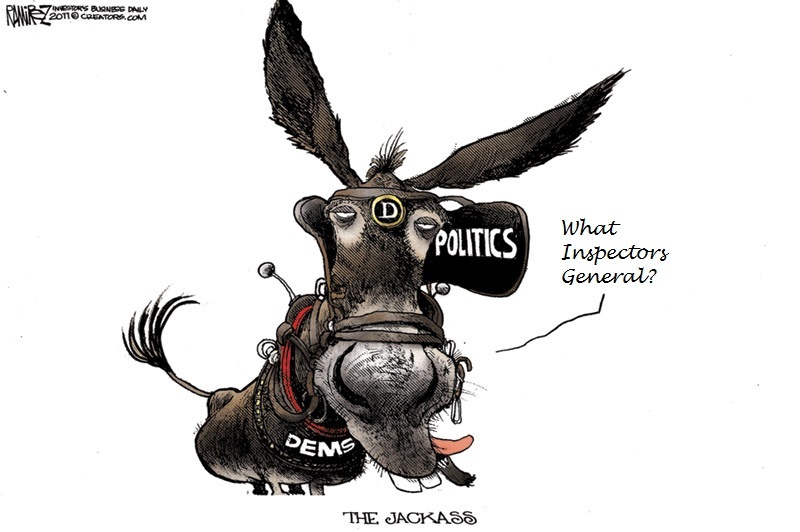 In the sadistic era of fraudulent Hope and Change, inspectors general inside the federal government have been kicked, neutered and starved of the authority and information they need to do their jobs. It’s transparently clear: President Obama loathes and fears independent watchdogs. While defanging Washington’s most effective guardians on the public’s trust and tax dollars, the Obama administration has stocked the government with whitewash puppies who’ve compromised the independence of IG offices at the Department of Homeland Security, the Interior Department and DOJ. Earlier this year in congressional testimony, DOJ IG Michael Horowitz exposed the Obama administration’s “continued refusal by the Department to recognize that Section 6(a) of the Inspector General Act authorizes the DOJ OIG to obtain access to all records in the Department’s possession that we need in order to perform our oversight responsibilities” as the office investigates the IRS witch hunts, the Fast and Furious scandal, and systemic public disclosure evasions. The FBI has repeatedly run out the clock to thwart IG document production requests and unilaterally claimed power to pre-screen and limit records disclosures. Smeared and sacked AmeriCorps inspector general Gerald Walpin after he blew the whistle on financial corruption and sexual misconduct by Sacramento mayor and Obama crony Kevin Johnson. Forced the abrupt retirement of Amtrak’s longtime inspector general, Fred Weiderhold Jr. after he met with Amtrak officials to discuss the results of an independent report by the Washington, D.C., law firm, Willkie, Farr & Gallagher, which concluded that the “independence and effectiveness” of the Amtrak inspector general’s office “are being substantially impaired” by the agency’s Law Department. Amtrak bosses had effectively gagged their budgetary watchdogs from communicating with Congress without preapproval; required that all Amtrak documents be “pre-screened” (and in some cases redacted) before being turned over to the inspector general’s office; took control over the IG’s $5 million portion of federal stimulus dollars; and regularly retained outside law firms shielded from IG reach. Stonewalled the Special Inspector General for the Troubled Asset Relief Program responsible for monitoring hundreds of billions of dollars of federal funds spent on bailout programs. Obama Treasury Department officials initially refused to provide documents on the bailout-funded AIG bonus program and ran to the DOJ for cover. Bullied budget watchdogs at the Office of Personnel Management, who received a “not so veiled threat” from the Office of Management and Budget to refrain from voicing any concerns about Obama’s 2010 budget to Congress. According to then OPM IG Patrick McFarland, an OMB staffer threatened to “make life miserable for us” if McFarland’s office dared to exercise provisions in the Inspector General Act noting any financial impacts that might “substantially inhibit” the watchdog agency’s ability to do its job. Just last week, the Veterans Administration IG issued a report detailing horrific neglect and mismanagement in the Phoenix VA system, where a whopping 45 percent of vets with bladder, prostate, and urinary tract problems were denied or delayed car over the last two years. Medical records are missing or misfiled. At least five patients died as a result of the VA’s dereliction of duty to those who served and sacrificed. Empowering IGs to uncover mismanagement in the public sector without fear of reprisal and roadblocks is quite literally a matter of life and death. Restore the letter of the federal inspector general law, Congress and unleash the taxpayers’ guard dogs! Watchdogs assigned to root out fraud and corruption inside federal government agencies encounter so many barriers during their investigations that they’re calling on Congress to pass legislation that will guarantee the access they’re already supposed to have. The cry comes on the heels of a new Justice Department restriction on information that its inspector general (IG) can access during agency probes. Remember that President Obama promised to run the most transparent administration in history yet the Department of Justice (DOJ), an extension of the executive office, is limiting what its watchdog can see during what’s supposed to be an independent investigation. This goes contrary to a 1978 law requiring that inspectors general act autonomously when they conduct probes of the federal agencies they’re assigned to keep in check. This is hardly the case. In fact, Judicial Watch has reported for years about the obstacles that inspectors general have faced as they do their job to crack down on waste, fraud and corruption in government. There are 73 IGs and, although they report to Congress, each is appointed by the president. For years current and former employees at IG offices have alleged that the watchdogs work too closely with the leaders of the agencies they investigate and that many have succumbed to political pressure, in both Republican and Democrat administrations. In fact, a few years ago a number of IGs came under fire and faced retaliation and scrutiny after exposing wrongdoing at the agencies they were charged with investigating. The Council of Inspectors General on Integrity and Efficiency refers to the DOJ’s new policy in its letter to Congress, writing that it “sharply curtails the authority of the Inspector General for the Department of Justice (DOJ-IG) to independently access all records necessary to carry out its oversight responsibilities.” Furthermore, the IGs point out, it “represents a serious threat to the independent authority of not only the DOJ-IG but to all Inspectors General.” These watchdogs must have access, without delay, to all information and data in an agency’s possession that is deemed necessary to conduct oversight functions, the letter states. Forty-seven independent inspectors general who oversee the Obama administration are accusing officials of blocking their access to government documents, warning of “potentially serious challenges” to their authority. “Refusing, restricting, or delaying an Inspector General’s access to documents leads to incomplete, inaccurate, or significantly delayed findings or recommendations, which in turn may prevent the agency from promptly correcting serious problems and deprive Congress of timely information regarding the agency’s performance,” the inspectors general wrote in a letter to the House and Senate Oversight Committee chairmen and ranking members. The letter charges that they were denied documents on at least three separate occasions. In one instance, the Peace Corps allegedly refused to provide access to documents for an investigation into whether the agency was properly addressing sexual abuse cases. The inspectors general also accuse the Department of Justice of withholding FBI records that had been previously produced to investigators, and the Environmental Protection Agency of withholding documents related to an examination of the Chemical Safety Board. “Even when we are ultimately able to resolve these issues with senior agency leadership, the process is often lengthy, delays our work, and diverts time and attention from substantive oversight activities,” the inspectors general wrote.